Some of our magazine WordPress themes (e.g. MH Magazine WordPress Theme) have a built-in feature to display related posts below the post content. This feature shows a nice selection of related articles to your audience after they have finished reading a particular post. The related posts feature can therefore help you keep visitors on your website and lead to an increase in page impressions. This article covers the basics of using the built-in related posts feature to suggest content to your audience by displaying related articles on your website and we’re also going to show you some alternatives to the built-in related posts section in your WordPress theme. In case the related posts are not showing up by default below your post content, please ensure that you’ve enabled the related posts feature in your WordPress dashboard. 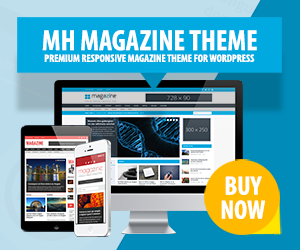 For the MH Magazine theme, this is option can be found under Appearance => Customize => Theme Options => Layout – Posts/Pages in your WordPress dashboard – for other themes, the path might be slightly different. In case you have already enabled the related posts feature and if there still are no related posts shown on your website, it is very likely that you haven’t tagged your articles the correct way. For more information about how this feature works and why you need to tag your articles, please keep reading as we’ve covered information about tagging your posts within this article as well. The related posts feature displays posts based on tags. That means it is very important that you tag your articles properly if you want to use this feature the right way. Basically this is very simple, because whenever you have tagged your articles correctly, the related posts function will display other articles that have tags in common. In addition we have implemented the related posts feature to display random articles instead of a fix post order, so with every page impression there will be other related articles shown below the post content (although this can be affected by caching). When tagging your posts, please always keep the tags short and meaningful. Adding tags of several words or even as long as full sentences won’t work well and usually also won’t look very appealing on your website. We usually recommend to make use of tags with a length of up to two words. As a basic rule, you should keep in mind that the related posts feature can only be as good as you tag the articles on your website. If tags don’t make sense, your related articles won’t make sense either. For example, if you have an article about vintage cars, you might want to tag this article with cars. If you have another article about a cute dog in a car, where the article is about the dog and not about the car, it wouldn’t be a good idea to tag this article with dogs and cars. Because in that case there is a pretty good chance that the article about the dog will also be shown as related article for articles that are also tagged with cars, which very likely is something you don’t want. There also are several plugins available to add a related posts feature to your WordPress website. In case you have this feature already built-in with your WordPress theme, it is recommended to make use of it, because in that case you won’t have additional bloat and the design of the related posts section usually will match the design of your theme. However, if you want to use an alternative plugin instead, you could for example have a look at the Yet Another Related Posts Plugin (YARPP). If you are using WordPress themes by MH Themes and in case you encounter any issues with the built-in related posts feature of your WordPress theme, please see the following support article for more information, recommendations and possible solutions to any issues that might occur while displaying related articles on your website: Solving issues with the related posts feature. To sum up, there are a few things you should keep in mind when making use of the built-in related posts feature in your WordPress theme. One is to make sure the related posts feature is enabled, whether it is a built-in feature or a 3rd party plugin. Secondly, you need to tag your articles correctly and that means your articles should be tagged with suitable tags only and in general tags should be kept short and meaningful to use this feature in the most efficient way. Hi Jill, you’ve already disabled the built-in related posts section in your theme. The related posts which you still see on your website are not provided by the theme itself, but by the JetPack plugin you are running. That means you need to check your settings within the JetPack plugin to disable the related articles. For more information about related posts, please see also: Solving issues with the related posts feature. Is it somehow possible to move related articles to show below the comments? I find that it takes up so much space so people might not even notice that they can comment on my blog posts. Hi Veronica, changing the order of these sections usually isn’t possible without coding this accordingly within a custom child theme. But if you think that related articles take up too much space on your website, then you could also simply disable that feature or, as an alternative, add a call to action at the end of your posts to encourage people to leave comments. How can I change the title Related Articles? I want to use another language. Thanks! Hi Alejandra, you can easily translate your WordPress theme into your preferred language by using Loco Translate, please have a look at: How to translate WordPress themes. Thank you! It seems my WordPress theme by MH Themes already has this feature, but I couldn’t configure it. I saw the translation in the es_ES.po file, but it didn’t work. Your WordPress theme is translation-ready and comes with some translations included. But in order to actually translate missing strings, you can either go the easy route by using the Loco Translate plugin or you can translate the strings in the .po file with tools like Poedit. Please also keep in mind that you actually need to set your WordPress installation to Spanish language in your dashboard under Settings => General in order to make your translation work. If you don’t do this, then your WordPress theme won’t load the Spanish translation files. Thanks again. My mistake was that I just translated the .po file. Poedit does also the compilation for the .mo file. Thank you!! !